Lora Bay has become of the most successful real estate developments in the Southern Georgian Bay area. Located between Meaford and Thornbury on a beautiful sweep of Nottawasaga Bay, the dramatic and scenic terrain of the property made it perfect for the challenging championship golf course co-designed by PGA Tour Professional Tom Lehman and celebrated golf course architect Thomas McBroom. It also made the site perfect for an attractive, upscale community centered around the course. And a site plan that incorporated winding streets, mature bush, and beautiful views of the course and the Bay – along with a sound choice of builders – helped the real estate development gain the momentum that would carry it through the real estate slump precipitated by the financial crisis of 2008. But a decision early on to create a true community has played no small part in Lora Bay’s success. The corporation dedicated a staff member to coordinating events and building relationships with existing and prospective homeowners, and a vibrant neighborliness thrived at Lora Bay. 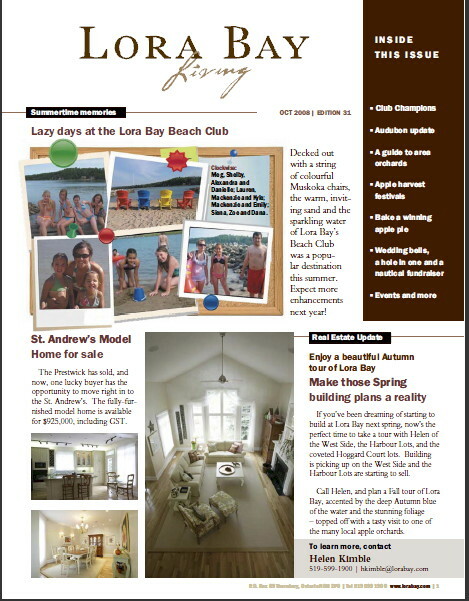 Beginning in 2006, myFavoriteMarketer wrote and designed a regular newsletter to help forge these community ties – and to show prospective homeowners what was waiting for them at Lora Bay. A newsletter of sorts existed, but it was dry and somewhat corporate. We determined to make the new publication an interesting read, something like a (very small) magazine. We branded it “Lora Bay Living”, incorporating the Lora Bay logo into our new banner, and insisted on telling stories of interest to homeowners and prospective buyers, using a conversational tone and a friendly style. We tried, as much as possible, to introduce and profile new neighbours, interviewing owners and writing up their stories. The images below link to two samples of Lora Bay Living.